My grandma has been working with a lady named Natasha for about 20 years. They are like best friends at this point and partners in crime. Each summer, my parents have my grandma and her friend Natasha stay with us twice a week because they work in NJ during the summer months to cater to their clients going down the shore to their vacation homes. They curse in Russian, come with funny jokes and stories, and love to gossip. 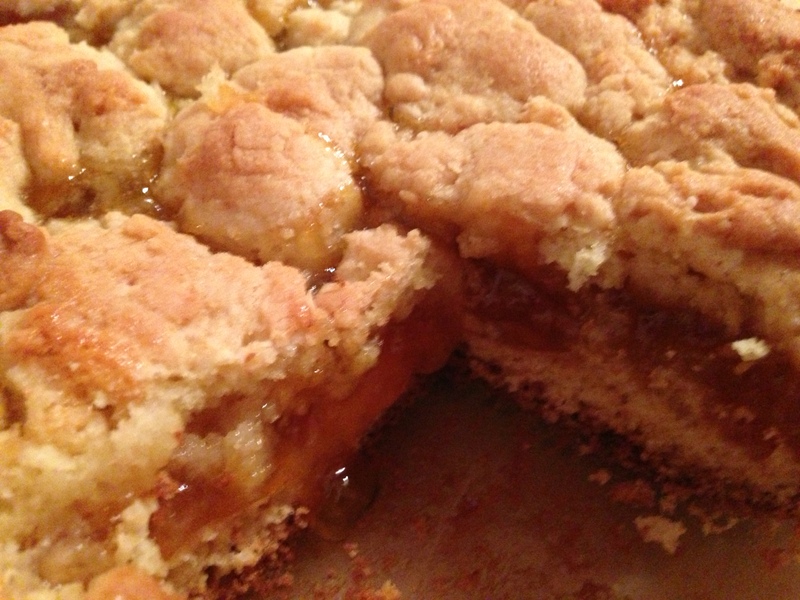 Natasha started bringing this amazing apricot crumble cake (tort) and every time she brings it I can’t stop eating it. This is one of her home-made recipes. I finally got the brains to ask her for it, and I thought I could never replicate and even though I only tried once, It was still almost the same and super tasty. Not to mention it took me like 15 minutes to make, and 30 minutes to bake! For under an hour, I’ll take it! Preheat the oven the 350 degrees. Melt the butter completely and cool it slightly. Add the sugar, vanilla, and eggs, and mix until just combined. Add sour cream or farmer cheese, then baking soda and stir to combine. Add 2.5 cups of flour, mixing with a spoon to combine until able to use hands to form a round ball. Should not be very sticky to the touch, if so, add a pinch more flour. Take 3/4 of the ball and press the dough into a slightly floured 8 ” x 11″ pan, rounding around the sides/edges to hold the apricot preserves. 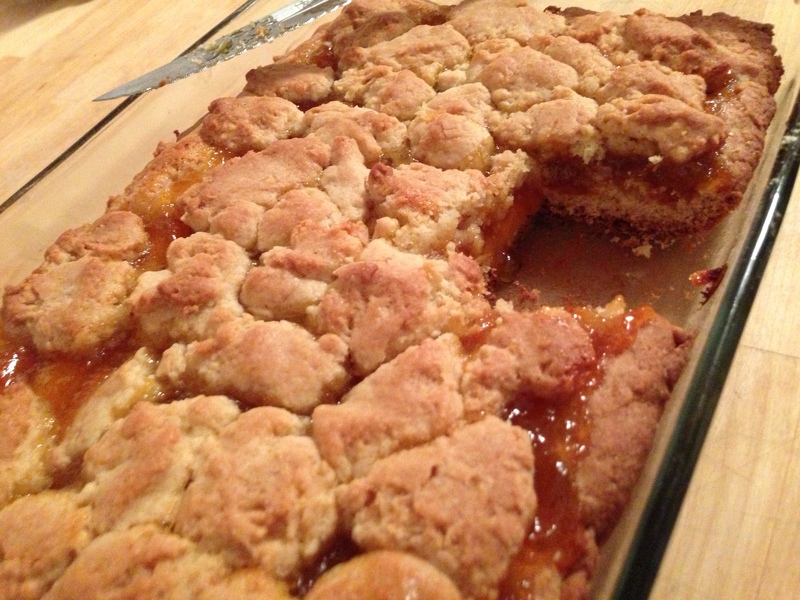 Spread apricot preserves evenly throughout the top of the base. Take the rest of the ball and take quarter sized pieces off at a time, placing them on top of the apricot preserves to almost cover it but not fully (keep in mind dough will bake/spread in the oven). That’s it! 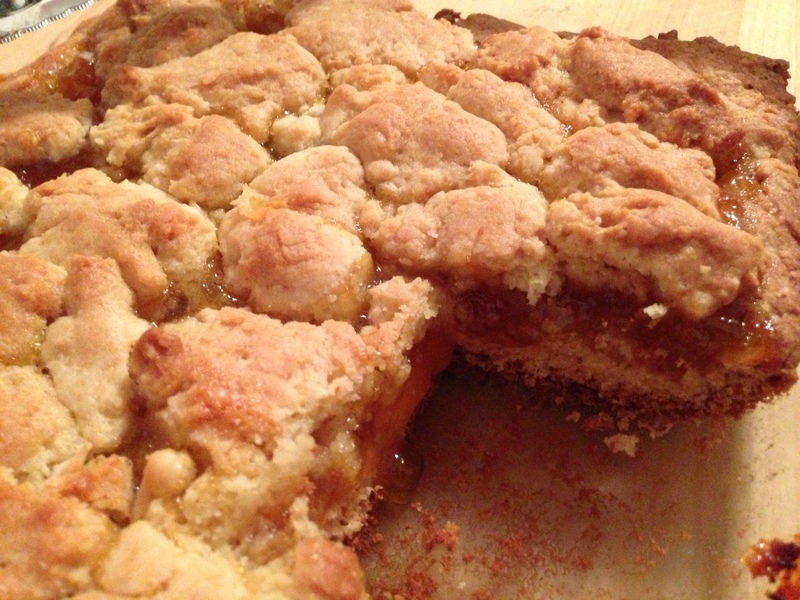 Pop it into the oven for 30-35 minutes or until the edges are brown and enjoy!